Who doesn't love an amazing pasta dinner? When you're entertaining guests, the perfect dinner recipes are those that will impress your guests with their wonderful flavors and elegant presentation but don't require you to stay cooped up in the kitchen for hours. Let these quick, delicious, and gorgeous 30-minute pasta recipes help you enjoy your own dinner party, while still wowing your guests with your fabulous cooking skills. Not only are these recipes wonderful for a planned party, but they are also great go-to recipes for those times when last-minute guests drop by too. 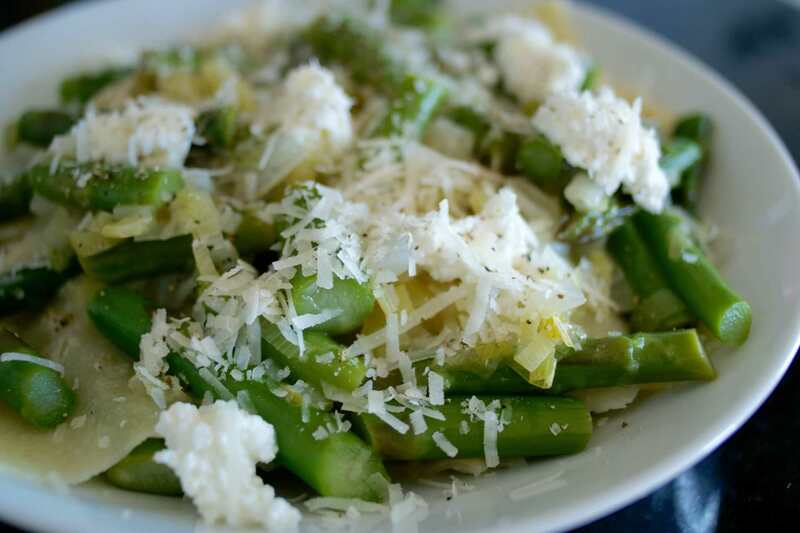 This elegant and easy pasta dish with rich, creamy ricotta, bright green asparagus, and freshly grated Parmesan cheese makes a wonderful dinner for guests. Creamy ricotta cheese adds a sense of indulgence without overpowering the freshness of the asparagus. Sunny lemon keeps things bright even as the pasta gives it that cozy feeling. In short, it's a warming yet spring-like pasta dinner to delight your friends at any time of year. Easy and sophisticated, this garlicky shrimp pasta recipe is simply delicious and so easy to prepare that it will quickly become one of your go-to dishes when the company is coming over. Sweet shrimp are tossed quickly in a pan with freshly minced garlic, lemon juice and zest, white wine, and red pepper flakes, then folded into your favorite pasta noodles with pine nuts and Parmesan. Your guests will never know it took under 30 minutes to make! This fancy tasting yet simple recipe for pesto salmon pasta is absolutely perfect for company when you're looking for something special to serve. It's a dish that is so easy to put together and it's perfect for entertaining, even (or especially) if you are a beginner cook. Grilled salmon is tossed with spaghetti or fettuccine in a rich and creamy sauce that's made with cream, Parmesan cheese, store-bought basil pesto, and sour cream. Happily, sometimes the meals that impress are also those that are simple to make. That's definitely the case with this nourishing 30-minute meal that tastes like a fancy gourmet dish and is vegetarian-friendly too. Your guests will be wowed with the wonderful flavors of this easy pasta recipe that combines savory, salty-sweet sun-dried tomatoes with mild, green-tasting canned artichoke hearts, and fresh chopped basil, for a fabulous effect that's greater than the sum of its parts. You're sure to earn a reputation as the hostess with the mostest when you serve this gourmet-inspired pasta dish at your next dinner party. In this surprisingly simple clam pasta recipe, salty-sweet clams are steamed quickly in a light broth of fresh tomatoes, onion, garlic, and white wine, and then ladled over a bowl of spaghetti or linguine pasta. You won't believe how much amazing flavor can come from so few ingredients! Wow your vegan friends when you invite them over and serve this unbelievably creamy and aromatic vegan mushroom pasta recipe that's miles more delicious and rich tasting than the usual vegetable pasta dish. Ready in less than 30 minutes, but with a taste that suggests you spent hours in the kitchen, this pasta recipe features an addictive homemade mushroom sauce that's much like a classic Stroganoff, but is made creamy from vegan-approved soy milk and dairy-free sour cream. A fabulous dish to prepare when you're surprised by company, or just to spruce up weeknight family dinners. Sometimes, it's handy to have a go-to recipe for when late-night guests come by, and you want to serve them something that tastes both rich and light. This clever, simple, delicious pasta dish achieves all that and takes only 15 minutes to make from start to finish. How? The sauce is made with a combination of mascarpone cheese and a lively amount of lemon, for a fresh and creamy pasta that makes a wonderful late evening dinner. You could also add chicken, shrimp, or prosciutto to this easy dish, for a more substantial meal. Serve this Greek-inspired pasta to guests during a sit-down lunch or dinner, or cold for a picnic, and get ready to collect the compliments that are sure to come. Quick and easy to prepare, this is a vegetarian pasta recipe that tastes equally good served hot or cold, making it a go-to dish in your arsenal. It's also chock full of healthy fiber and protein, so it leaves your guests feeling full and satisfied. If you're bored of the usual spaghetti dishes, try this savory pumpkin pasta recipe for something different. Elegant and unexpected, this pasta recipe is suitable for vegan and vegetarian diets and will fill your kitchen with a delicious aroma. The tasty pumpkin and sage sauce is also naturally low in fat and perfect for the main dish at your dinner parties, especially in autumn. Trendy and inspired by California haute cuisine, this simple and delicious recipe for tuna carbonara is ready to eat in about 20 minutes, start to finish. It also uses ingredients you most likely have on hand in your pantry, fridge, and freezer, making it a fantastic choice to make when last-minute guests drop by on weeknights or weekends. This quick and easy pasta recipe is also super versatile and includes plenty of ideas for additions, substitutions, and variations that help you make this recipe your own. Pesto pasta is a favorite for serving to company, but the addition of mint in this pesto recipe truly makes this a special dish. The recipe also includes instructions for a nut-free pesto, if nut allergies are a concern. Mint, basil, lemon juice, and fresh Parmesan cheese create a lovely, bright, clean, and delicious flavor that makes this pasta dish sing. Edamame beans add wonderful texture and healthy protein. Best of all, you can throw this recipe together in under 30 minutes, making it ideal when you are running a bit behind schedule. Every home chef worth their salt needs to know how to make a quick, homemade Alfredo pasta sauce. Rich, creamy, and always right for company, pasta Alfredo has long been a dinner party favorite, for good reason. This quick, from-scratch Alfredo spaghetti recipe uses heavy cream, butter, and Parmesan cheese to make the creamiest pasta Alfredo ever. Serve with a tossed green salad for a simply perfect meal your guests are sure to love. This delicious dinner recipe can be whipped up in little more time than it takes to boil the pasta, making a great choice for get-togethers, busy weeknights, or whenever you want a nice dinner without spending too much time in the kitchen. Arrabbiata literally means "angry," and this classic Roman pasta dish gets its name from the spicy fresh tomato sauce in this recipe, made with garlic and red chile peppers for a nice little kick. Easy fennel pasta can be served as a side dish at dinner parties or makes a simple, delicious late-night dinner for guests. Browned garlic brings out the sweetness of the fennel in the sauce, which has a lovely spring-like flavor. This Sicilian version of pesto pasta, called Pesto Alla Trapanese, comes from Trapani, Sicily, where tomatoes and almonds are plentiful. You can put this unusual, delicious pasta dish together in about 20 minutes, leaving you plenty of time to mingle and enjoy your guests when company is over. 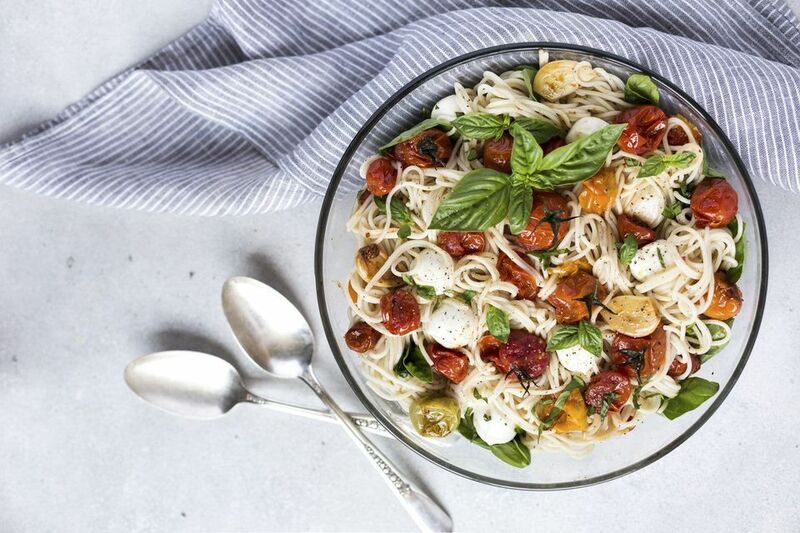 Almonds, garlic, sea salt, and fresh basil combine with fresh cherry tomatoes, olive oil, and Italian cheese in this richly flavorful pasta dish that tastes wonderful hot or cold. Want to serve your guests a classic Southern Italian pasta dinner that's packed with traditional Mediterranean flavors? They'll absolutely love this Pasta Alla Puttanesca recipe that you can make easily in about 15 minutes (yes, you read that correctly), but tastes like it's been simmering on the stove all day thanks to its rich, bold, and complex taste. The flavorful, slightly spicy, tomato sauce features savory olives, capers, and anchovy. (Even if you don't think you like anchovies, give this sauce a try: they melt away into the sauce, adding depth, but no fishy taste). Don't just save this one for guests either - it makes a wonderful family meal on busy weeknights when you're craving comforting food. Caprese pasta takes the three stars of Caprese salad - juicy tomatoes, fragrant basil leaves, and mild, fresh mozzarella cheese – and combines them with hot, cooked pasta for a super easy, light, and elegant dinner dish that's ready in less than 30 minutes. This simple, colorful pasta is a wonderful main dish for luncheons, or anytime you want to serve a lighter meal. A frittata is a hearty, Italian-inspired omelet that starts on the stove top, and is finished in the oven. This filling version, which makes a great weekend brunch for overnight guests, features leftover cooked pasta, chopped vegetables, basil and plenty of cheese. When you're entertaining guests for dinner, this chicken pasta recipe with lemon pesto is an elegant main dish recipe to serve. Lemon juice and zest add a freshness that brings out all the flavors in this bright dish that's made with prepared pesto sauce, cream, garlic, Parmesan, tender chicken, and peas. The Naples classic recipe of spaghetti with olive oil, garlic, and red chile pepper is one of the simplest, quickest, and yet most satisfying pasta dishes in Italian cuisine. The entire dish is ready in just about the time it takes to cook the pasta, making it a fabulous dinner to serve for a crowd or for an intimate, late-night supper with good friends. Here's a great side dish for dinner parties that's ready in a short span: creamy broccoli pasta. It makes a great everyday meal, with fresh grated Parmesan cheese, butter, and heavy cream this dish has pesto-like broccoli sauce that is super rich and delicious. Simple and elegant, this quick and easy vegetarian pasta dish with spinach and ricotta cheese makes a lovely dinner or side dish when you're entertaining. You can also tweak this recipe to suit your taste, with plenty of creative ideas for variations included in the recipe. Warm pasta tossed with cool, ripe tomatoes is a fresh and elegant contrast that's simple and elegant on the plate. Make it with store-bought fresh pasta and good quality Parmesan cheese and serve with hot and toasty garlic bread, for a taste of Italian summer.